Tradition says that at the dispersal of the Apostles after Pentecost, Saint Thomas was sent to evangelize the Parthians, Medes, Persians and Indians; he ultimately reached South India, carrying the Faith to the Malabar coast, which still boasts a large native population calling themselves “Christians of St. Thomas.” The Apostle is believed to have speared to death in Mylapore (Madras). His feast day is July 3rd and is the patron of architects. The earliest record about the apostolate of St. Thomas is the apocryphal Acts of Judas Thomas, written in Syriac in Edessa. A number of fragmentary passages in other writings of the third, fourth and the following centuries speak about the Indian apostolate of St. Thomas. The Indian traditions of the Apostolate of Saint Thomas consist of a combined tradition of Kerala, Mylapore/ Coromandel, and the East-Syrian Church. The Portuguese in early sixteenth century has recorded the tradition. This article examines, 1) Acts of Thomas, 2) Early references about the Apostolate of Saint Thomas in India, 3. Which India meant ? 4) About the Indian Tradition of Saint Thomas and Records of the tradition, 5) Further references about Saint Thomas Christians, 6) Statements of prominent Indian Statesmen, 7) Statements of Religious Leaders . The earliest record about the apostolate of St. Thomas is the apocryphal Acts of Judas Thomas, written in Syriac in the Edessan circle (Edessa, today called Urfa, in eastern Turkey), about the turn of the third century A.D. Even though this work has been acknowledged as apocryphal, Gnostic in touch, and romantic in style, several scholars find in it a historical nucleus, which represents the second century tradition about the apostolate of St. Thomas in India. The Syriac text is published by P. Bedjan, Vol. III (1892), W. Wright, (1871), A.F.J. Klijn (1962) gives an English text: A.E. Medlycott, (1905), pp. 221-25, indicates different versions and editions of the Acts, and pp. 213-97, provides a critical analysis of the same. J.Farquhar’s articles are also useful. Act of Thomas Contents– King Gudnaper ( Gundapar) of India sent Haban to get an architect to build a palace. Habban took with him Thomas, who was sold to him by Christ. Both landed in Sandroqmaboza ( Andropolis in the greek version) . Thomas there converted the royal couple after performing a miracle. Both went to Gudnapar. Thomas got money to build the palace, but spent it for the poor. Thomas was imprisoned. Gudnapar’s brother Gad saw in heaven the palace built by Thomas. Thomas was released and the royal brothers baptized. Thomas went to the kingdom of Mazdai: baptized the queen: was imprisoned for having preached continence to the women of the palace. He died a martyr having been pierced through by the lances of the soldiers of Mazdai. The Acts of Judas — Thomas, probably originated in a milieu of Upper-Mesopotamia, perhaps Edessa, and go back either to the last quarter of the second century A.D. or to the first years of the third. The author is a Syrian who is able to recognize the name ‘Thomas’ as a nickname derived from t’omo, which means twin; therefore he has preserved the real name, Judas, which, according to the old Syriac version of the Gospels, was the name of Thomas-Didynius. From this detail we can assumes that, in those days, the old version of the Gospels had not yet been replaced by the Peshitto. According to the Acts, the Apostle St. Thomas preached the Gospel in the land of Gondaferes or Gundaphares. This prince is the Parthian King Guduphara, who was ruler of Afghanistan and the Punjab during the second quarter of the first century A.D. Most of the critics of the nineteenth century have refused to concede any historical value to the Acts of Judas—Thomas and nobody can deny that they are full of fabulous details. It has recently been observed that it was unlikely for a writer of the third century to have invented the story contained in the document. It is remarkable that the sovereign’s name, which is a historical one, should have been preserved intact in a rather remote country, and all the more so as it has left no traces in any historical or legendary work of India, and has reappeared only in the nineteenth century on coins and on an inscription of Gandhara. The Gudnapar ( Goundophoros in the greek version) could also be King Kandapa or Kandapar to whom the Coromandel traditions connects to Saint Thomas. The highly documented study of A. E. Medlycott in 1905, the thesis of Fr. Dalhmann SJ in I912, and the articles of J. N. Farquhar in 1926, have effectively contributed towards lessening the suspicions of the critics about the Apostolate. It is therefore quite possible that when driven away by the invaders, Habban, the kings merchant and his friend Saint Thomas chose as a place of safety one of those harbors of South India, Muziris for example, where there were many Jews, Syrians, Greeks etc. In accordance with the tradition, the Apostle probably left the mouth of the Indus for Socotra, and from Socotra he must have reached Muziris, Cranganore. Mazdai, in whose Kingdom the Apostle died could be the South Indian ruler of Pandya of the Coromandel coast who was Matsiadev , ie, King of the fish emblem as he was called. The name of the person seen in the Acts do not as a whole appear as Indian or South Indian might be due to the romantic nature of the Acts. Medlycott ( 1905), AC Perurnalil ( 1952), Vath ( 1925), Hambye ( 1952), Farquhar ( 1926), Dahlmann ( 1912) are some of the detailed studies published about this. Besides, a number of fragmentary passages in other writings of the third, fourth and the following centuries speak about the Indian apostolate of St. Thomas. From the fourth century onwards the major Churches are unanimous in their witnessing to the tradition. I.The Acts of Judas Thomas Century: 2nd/3rd (c. 180-230) Church represented: Syrian Sources. Gist of Testimony : The Apostles cast lots as to where they should go, and to Thomas, twin brother of Jesus, fell India. Thomas was taken to king Gondophoros as an architect and carpenter by Habban. The journey to India is described in detail….After a long residence in the court he ordained leaders for the Church, and left in a chariot for the kingdom of Mazdei. There, after performing many miracles, he dies a martyr. II. Clement of Alexandria Century: 3rd (d.c. 235) Church represented: Alexandrian/Greek Biographical Note : Greek Theologian, b. Athens, 150. After conversion, and touring Italy, Syria, and Palestine taught at the oldest centre of sacred science in Christian history viz. The Catechetical School of Alexandria where he succeeded his teacher Pantaenus. Defended orthodoxy against Gnosticism. Gist of Testimony : Clement makes a passing reference to St. Thomas’ Apostolate in Parthia. This agrees with the testimony which Eusebius records about Pantaenus’ visit to India. III . Doctrine of the Apostles Century: 3rd Church represented: Syrian Sources.It may be termed the primitive Manual of Catechism of the Church, representing its early usages, customs and belief. Gist of testimony : “After the death of the Apostles there were Guides and Rulers in the Churches…..They again at their deaths also committed and delivered to their disciples after them everything which they had received from the Apostles;…(also what) Judas Thomas (had written) from India”. “India and all its own countries, and those bordering on it, even to the farther sea, received the Apostle’s hand of Priesthood from Judas Thomas, who was Guide and Ruler in the Church which he built and ministered there”. In what follows “the whole Persia of the Assyrians and Medes, and of the countries round about Babylon…. even to the borders of the Indians and even to the country of Gog and Magog” are said to have received the Apostles’ Hand of Priesthood from Aggaeus the disciple of Addaeus (Cureton, pp. 32, 33, 34). IV. Origen Century: 3rd (185-254?) quoted in Eusebius, cf. infra Church represented: Alexandrian/ Greek Biographical Note : Christian Philosopher, b-Egypt, Origen taught with great acclaim in Alexandria and then in Caesarea. Edited the Bible in six parallel Hebrew and Greek versions (the Hexapla). Many other works including his theological De principis and his polemical Contra Celsum. Gist of Testimony : He is the first known writer to record the casting of lots by the Apostles. Origen’s original work has been lost; but his statement about Parthia falling to Thomas has been preserved by Eusebius. “Origen, in the third chapter of his Commentary on Genesis, says that, according to tradition, Thomas’s allotted field of labour was Parthia”. V. Eusebius of Caesarea Century: 4th (d. 340) Church Represented: Alexandrian/Greek Biographical Note : Eusebius of Caesarea or Eusebius Pamphill, Greek historian, wrote Ecclesiastical History in 10 books. VI. Ephrem Century: 4th Church Represented: Syrian. There the devil speaks of St. Thomas as “the Apostle I slew in India”. Also “The merchant brought the bones” to Edessa. In another hymn apostrophising St. Thomas we read of “The bones the merchant hath brought”. “In his several journeyings to IndiaAnd thence on his return, All riches, which there he found, Dirt in his eyes he did repute when to thy sacred bones compared”. In yet another hymn Ephrem speaks of the mission of Thomas “The earth darkened with sacrifices’ fumes to illuminate”. “A land of people dark fell to thy lot”, “a tainted land Thomas has purified”; “India’s dark night” was “flooded with light” by Thomas. VII. Gregory of Nazianzus Century:4th (d. 389) Church Represented: Alexandrian/Greek Biographical Note : Gregory was born A. D. 330, consecrated bishop by his friend St. Basil; in 372 his father, the Bishop of Nazianzus induced him to share his charge. In 379 the people of Constantinople called him to be their bishop. By the Greeks he is emphatically called “the theologian’. VIII. Ambrose of Milan Century:4th (d. 397) Church Represented: Western Biographical Note : St. Ambrose was thoroughly acquainted with the Greek and Latin Classics, and had a good deal of information on India and Indians. He speaks of the Gymnosophists of India, the Indian Ocean, the river Ganges etc. a number of times. “Parthia receives Mathew, India Thomas, Libya Thaddeus, and Phrygia Philip”. “This Thomas preached the Gospel of Christ to the Parthians, the Medes, the Persians, the Hyrcanians and the Bactrians, and to the Indians of the Oriental region and penetrating the innermost regions and sealing his preaching by his passion he died transfixed with a lance at Calamina…a city of India, and there was buried with honour”. “Peter receives Rome, Andrew Achaia; James Spain; Thomas India; John Asia. 3. Which India meant ? Saint Jerome and Saint Ambrose had knowledge about the customs of the Brahmins who certainly were inhabitants of South India. Saint Ambrose, morever describing the journey of a Thebean says that he reached “ Muzirim totius Indiae citra Gangem emporium”. Muziris, was none other than Cranganore on the Malabar coast as is clear from early Roman and Tamil writings. The IXth century martyrology of Usuard ( Idibus Juli ) distinguishes the India of Bartholomew from the India of Thomas which latter, it says “ is on the confines of the wolrd” where “Thomas was pierced through”. 4. 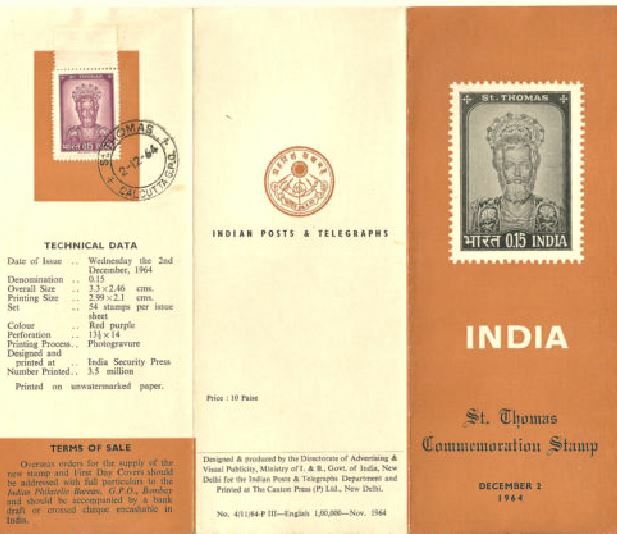 About the Indian Tradition of Saint Thomas and Records of the tradition. The Portuguese accounts are more comprehensive and they drew freely on the oral tradition, folk songs, accounts and Syriac books, which the community possessed at that time. Almost all the local accounts, especially the Syriac books, were burnt by the Portuguese authorities during and after the Synod of Diamper. A letter written by Manuel Gomes, one of the visitors to the tomb in 1517: which he penned it from Mylapore itself. The report of the inquiry of 1533. A letter from the citizens of Mylapore (called by the Portuguese as Sao Tome at the time of the composition of the letter). A few letters of Miguel Vas and of Francis Xavier are some of them. These information from these primary sources may be supplemented with the descriptions given by such writers as Barbosa (1918-21), Barros (1777-78), Calado (1957), Castanheda (1551), Correa (1560-63), Gomes (1926), Gonçalves, D. (1955), Goncalves, S. (1957-62), Andrada (1540), Osorius (1571), Dionysio (1578), Monserrate (c. 1579), Valignano (1583), Maffei (1747), Andre de Santa Maria (1598-99 and 1601), Lucena (1600), Ros (1601 and 1604 and 1586/Hausherr (1928), Gouvea (1606), Couto (1603-11), Ramusio (1550). There are also a few other documents, like the gift deed donating the Little Mount to a certain religious order, letters of Ruy Vicente (1581), D. Leitao (1581), and A. Boves (1599). Also writings of later missionaries like Montforte (1751), Soledade (1705), Paulo de Trindade (1962-67), Sebastiani, Paulinus etc. Many of these documents are published by J. Wicki ( 1948) and Silva-Rego ( 1947). Studies based on these are published in English by Schurhamrner (1957) and Mundadan. ( 1970). Several attempts have been made to convert the oral tradition into writing. Bernard’s Malayalam history of the St. Thomas Christians contains a good deal of the oral tradition. L.W. Brown and Card. Tisserant reproduce some of it. Hambye, Placid explored this sources more systematically. In 340-360 AD ( 7th century ?) Thazhekad sasanam granted special privileges to the Nasranis. The edict was written on stone and provides proof of the early existence of Nasranis in Kerala. Theophilus (surnamed the Indian), an Arian, sent by Emperor Constantius (about 354) on a mission to Arabia Felix and Abyssinia is another earliest account which draws attention to the Christians of Malabar coast. He had been sent when very young a hostage a Divoeis, by the inhabitants of the Maldives, to the Romans in the reign of Constantine the Great. His travels are recorded by Philostorgius, an Arian Greek Church historian, who relates that Theophilus, after fulfilling his mission to the Homerites, sailed to his island home. He visited other parts of India, reforming many things — for the Christians of the place heard the reading of the Gospel in a sitting, etc. The people referred to were the Christians known as a body who had their liturgy in the Syriac language and inhabited the west coast of India, i.e. Malabar. Ephrem the Syrian ( ca. 306 – 373) who is venerated by Christians especially among Syriac Christians throughout the world writes many hymns, poems and homilies about St. Thomas mission in India. “‘Blessed art thou, like unto the solar ray from the great orb; thy grateful dawn India’s painful darkness doth dispel. The facts relating to the Apostle St. Thomas evangelization of India are not attested only by the one individual, Ephrem the Syrian, but carry with them the assent of a whole Syrian Church, that of Edessa. A long public tradition in the church at Edessa honoring Thomas as the Apostle of India resulted in several surviving hymns that are attributed to Ephrem, copied in codices of the 8th and 9th centuries. References in the hymns preserve the tradition that Thomas’ bones were brought from India to Edessa by a merchant, and that the relics worked miracles both in India and at Edessa. A pontiff assigned his feast day and a king erected his shrine. The embassy of Alfred in 833 CE described the Syrian Christians as being prosperous and enjoying high status in the Malabar coast. A Syriac codex preserved in the Vatican archives, written in Cranganore in 1301 AD, refers to the Apostle Thomas as the founder of the Indian Church. The legends of Prester John of the Indies, popular in Europe from the 12th through the 17th centuries, told of a Christian patriarch and king said to rule over a Christian nation lost amidst the Muslims and pagans in the Orient. Written accounts of this kingdom are variegated collections of medieval popular fantasy. Reportedly a descendant of one of the Three Magi, Prester John was said to be a generous ruler and a virtuous man, presiding over a realm full of riches and strange creatures, in which the Patriarch of Saint Thomas resided. He was immortal, wealthy and powerful and also eager to join with Europe to fight a crusade against the Muslims. The legend of Prester John had three historical sources; the Saint Thomas Christians of India, the Christian Empire of the Ethiopian Coptic Christians, and the Nestorians of Mongolia and Central Asia and these attracted the Europeans to India. Since the arrival of Portuguese we have a number of records as mentioned above in the form of letters, reports and short histories. These are more comprehensive and drew freely on the oral tradition, folk songs, accounts and Syriac books, which the community possessed at that time. Dr. S. Rajendra Prasad, President of India ( 1952-62), from his speech at the Saint Thomas Day Celebrations in New Delhi on 18 December 1955. Giani Zail Singh, President of India (1982 – 1987) , from his speech on October 26, 1983, inaugurating the Paurastya Vidyapitham, Vadavathoor, Kottayam. Pope John Paul II on his vist to India in 1986, at the Thomas Shrine, Madras – 5 February 1986. Note – The studies published on the different texts and passages about the Apostolate of Saint Thomas in India are, Medlycott – “ India and the Apostle Saint Thomas ( An enquiry, with a critical analysis of the Acta Thomae” ( 1905), AC Perurnalil SJ- “ The Apostles in India, Fact or Fiction” ( 1952), Vath SJ – “Der Hl Thomas Der Apostle Indiens. Ein Untersuchung uber den historishen Gehalt der Thomas- Legende” ( 1925), Hambye SJ- “Saint Thomas and India“ ( 1952), J N Farquhar – “The Apostle Thomas in North India“, “The Apostle Thomas in South India“, J Dahlmann SJ – “ Die Thomas- Legende und die altesten historischen Beziehungen de Christentums zum fernen Osten” ( 1912). The Portuguese accounts published from Portuguese archives about the Indian tradition and records of the Indian tradition are – Dr. Silva Rego “ Antonio da, Historia das Missoes do padroado Portugues do Oriente, India Vol I ( 1500-1542)” “ Anonio da, Documentacao para a Historia da Missoes do Padroado Portugues do Oriente”, India 12 Volumes ( 1947) , Wicki Joseph SJ- “ Documenta Indica “ 7 Volumes, Rome ( 1948) , Schurhammer SJ “ Franz Xaver, Sein Leben und seine Zeit” “ Die Zeitgenesischen Quellen zur Geschichte “ “ Epistolae S Francisci Xaverii” “ Historia seraphica da Ordem dos Frades Menores des “. Mundadan “ Traditions of Saint Thomas Christians” ( 1970) The arrival of Portuguese in India and Saint Thomas Christians under Mar Jacob 1498-1552” ( 1967) and Schurhammer SJ “ The Malabar Church and Rome during the early Portuguese period and before” ( 1934), “ The mission work of the Jesutis in Muthedath and Porakad in 16th and 17th centuries” ( 1957) are some of the studies based mainly on these documents. Perhaps we are not giving enough importance to testimonials from liturgical calendars. Liturgical calendar describes dictates the rhythm of the life of every church. There are many information’s available from liturgical calendars. Each days associated passages of Holy Scripture, Saints and events for commemoration, and many times special rules for fasting or feasting that correspond to the day of the week or time of year in relationship to the major feast days. St. Thomas evangelization and death in India is very well documented in liturgical calendars of almost all eastern churches. Can that be also included ? the South eastern coast of India, then known as the Pandyan kingdom. Quilon, lands near the city with hereditament of low caste slaves. (Reference: Travancore Manual page 244). by the huge Chinese ships on their way from Canton to the Persian Gulf. trade relations with China in the East and the Western countries. establishment of flourishing Chinese settlement at Kollam. had seen in the course of his travels, in the 14th century. century Travancore conquered Kollam, followed by the British in 1795. Thanks for the write up on Kollam. Like John and George mentioned earlier in another post, often we dont discuss about Kollam and Nilackal. Thanks. The region north of the Indus River, which now resides in Pakistan, was at various times under the conrtol of the Persians, the Greeks, the Indo-Greeks, the Indo-Scythians, the Bactrians, and the Parthians. This region was known to each as the Hindu, a Persian word. In Hebrew, the word Hindu became Hodu, which is the word found in the first passage of Esther (and is the only use of the word in the Bible). Dio Cassius and Strabo recount the story of one Zarmoros, an “Indian” sent by the king of India (Pandion), who set himself on fire during the Mysteries of Eleusis in 20 BCE. This Pandion was a petty king who had gained a small territory within the Parthian empire (along with about 40 other petty kings) during a lapse in western hegemony. The Parthians soon regained control of this region of the Hindu. I did not mean to imply that Roman historians called Parthia or Persia by the name of India, but rather that the region of India was recognized as the eastern part of Parthia, just as it was earler a part of Persia and later recognized as the eastern part of various other empires such as the Scythians and Bactrians. The Greek author Philostratus describes Apollonius’ journey into “India,” but again, he is describing a trip to the Punjab. When the Thomasine legends speak of Gondopharus inviting Thomas into India, it is speaking again of the Indus valley. This king’s capital was Taxila in modern day Pakistan. The Greeks and Romans knew exactly where India was. It was the region immediately surrounding the Indus River, but it frequently made up part of these other empires. The Romans of the first and second century had no grasp of how far east these empires ran (even Alexander never went any further), so everything east was simply India, for lack of a better name. For our purposes, all of our extant evidence points to the Indus valley as the most eastern possibility for any of the described events. That’s close, but no cigar, being a thousand miles or more from the reputed first Jewish and Christian enclaves. I am increasingly agreeing with your views. There seems to be more legends than facts. Some of us have taken this DNA matter seriously and we are trying our best to forge ahead. This is becoming increasingly interesting with kind of unexpected results popping up. At this rate, I think we will know the truth in about 10years time. http://www.archive.org/details/historyofblessed02budg. It is a compilation of various stories from the various Infancy Gospels. As such, it is an old reference, since some of those works date from the 2nd century if not earlier. This is a good work to read, on its own merit, for Syriacophiles/Orientophiles and for those interested in some of the old stories concerning Jesus’ childhood and youth, as well as St Mary’s life that the Gospels do not deal with. What makes this reference particularly interesting to me (and I’m generally disinterested in stories about Thomas coming to India) is it distinguishes India from Cush, so there’s little doubt that the author is referring to our India, and not Ethiopia or Arabia. Moreover, the author mentions China, and the islands further, and a sea route … which may be used to argue against the usual Thomas-stopped-in-Parthia/Pakistan-(and not, say, Kerala or Mylapore). Not proof, of course, but an interesting, unambiguous, old reference. I didn’t find any mention of this above (of course, I could have missed it). I have revised this article . Thanks to John Mathew for the reference from Infancy Gospels. Please let me know if any further corrections or inputs are required. I would like to make a movie of Thomas in India. Would anyone like to join forces in this endeavor? First we make a treatment. I have culled some ideas from Acts of Thomas and other legends. Hello Peter Van Gorder, welcome aboard. You can count on me for the project and I have valuable information to share with from my perspective angle. I was planning to meet a film maker and here you are. There are lots to discuss and the picture is very rosy than it looks. The original story is so twisted and turned that we are now simply following the absurd. Not so recently, HH the Pope had issued statements that St. Thomas never visited India and that all Jews are not responsible for the death of Jesus. How can they be so sure about it.? To dig deep one should have access to the countless documents tucked in the archives of St. Peter’s Cathedral in Rome. They know something about it and I am able to guess the true story. It has got all the elements for a blockbuster movie. Ciao! Could you please guide me on the account of St Thomas coming to India. There are 3 traditions for which historians argue 1. Mylapore Tradition 2. Malabar Traditions and 3. North-west Traditions. Help me to ascertain which is correct? Movie on St Thomas Christian is a great idea.Start with Alexander the Great ordering Syrian settlements in the coast along Red Sea and India. These selllements were meant to be exporting factories feeding Alexandria.Syria in those days meant to be most of the semetic world.The trade shift from Tyre to Alexandria was a grand plan of Alexander the Great. Romans followed suit and made it huge. Search for the lost tribe of Israel for evangelisation and coming of St Thomas to Malabar are later stories. The mission of St. Thomas is of great importance to us Christians living in Sri Lanka. There is a document in the Portuguese National Archives of Torre do Tombo with a copy of the inscriptions found in the main door of S. Thomas tomb – when the Portuguese rediscovered it in the XVI century. Unlike the Great Mount cross (now at the church of Our Lady of Expectation) with inscriptions written in Pahlavi (dating to some time between the VII and IX centuries) – these ones are in modern Syriac characters and, as far as I know, are not yet deciphered. If those inscriptions are in modern syriac, I am surprised why it was not decifered yet. During the time of Portuguese excavations in Saint Thomas’ Tomb, the Thomas Christians of Kerala were well familiar with the language syriac. Their liturgies were in syriac language untill 1960s. Even today, there are several syriac scholars in Kerala among different Thomas Christian denominations- both East syriac and West syriac. So, there is no reason why those inscriptions were not decifered ! The inscriptions on the Mailappore Cross are in Pahlavi language. As everybody knows, decifering ancient pahlavi is difficult, but we have several scholars studied about it and we have a few satisfactory and acceptable explanations. These inscriptions denote the Phalavi phase of the Thomasine Christianity in India related to the South Persian province of the Church of the East. If you can provide a copy of the document with these syriac inscriptions, we can approach one of the many syriac scholars in Kerala to analyse it. >> If those inscriptions are in modern syriac, I am surprised why it was not decifered yet. 1 – Words and names get wrongly copied with time. You just got my name misspelled, e.g., as it happens often, unfortunately. In fact Afonso, comes from a Teutonic or Visigoth name. I already forgot the details, but it comes from Ildefuchs (meaning ready to, or fast attack). From Ildefuchs, evolved into Ildefonse, Alfonse, Afonso (in Portugal), etc. Regardless of the details here being correct or not (probably they are not totally correct) – the point is that with time, not only people copy names wrongly, but their meaning changes, or the origins are lost. So this may happen also with ancient languages, where at times is difficult to decipher old words/documents where names and words changed a lot from their original meaning/spelling. 2 – Maybe it was already deciphered – if such document was sent to the Portuguese King, I would suspect an effort in deciphering such an important inscription must have been done. Maybe such work was also lost meanwhile – specially after the big 1755 earthquake that destroyed most of Lisbon (withe following fire and tsunami) including the Royal Archives. 3 – I read a paper of Prof. Luis F. Thomas mentioning that he could not decipher the inscription. There are perhaps just around 100 historians in Portugal at great top level – with hundreds of centuries of overseas history to cover. Just to give you an example – Goa covers almost half millennium of Portuguese presence in India, that is older than some sultanates or Nababs, that came and went with time. Also the Portuguese territories spread up to East Timor – so basically there are too many topics of research and not enough academic/scientific personnel in Portugal. Just to give you a concrete idea – it is possible that a few forts/castle ruins exist in Masirah Island (out of the coast of Oman), yet no photos or any other info is know among the best Portuguese historians. Same thing applies to the Portuguese ruins in the extreme NW (not NE) of Qeshm island, in Bassadore (Basiduh) where nobody in Portugal in nowadays knows much about the extensive former Portuguese city in that Iranian island of today. So, the point here – no surprise nobody deciphered yet, since it is in a pile of huge documents at the National Archives that some people (like Prof. Luis Thomas – he is top best!!) got to know, but had no chance to further study the matter. >During the time of Portuguese excavations in Saint Thomas’ Tomb, the Thomas Christians of Kerala >were well familiar with the language syriac. Their liturgies were in syriac language untill 1960s. Even >today, there are several syriac scholars in Kerala among different Thomas Christian denominations- >both East syriac and West syriac. So, there is no reason why those inscriptions were not decifered ! Maybe there are – read above. I agree though that maybe the problem can be solved – it is not a “lost” cause. >The inscriptions on the Mailappore Cross are in Pahlavi language. As everybody knows, decifering >ancient pahlavi is difficult, but we have several scholars studied about it and we have a few >satisfactory and acceptable explanations. These inscriptions denote the Phalavi phase of the >Thomasine Christianity in India related to the South Persian province of the Church of the East. >If you can provide a copy of the document with these syriac inscriptions, we can approach one of the >many syriac scholars in Kerala to analyse it. I just arrived to Portugal – but I believe I can get a copy of the document, before I return to the USA next week. I shall keep in touch when getting a copy. My apologies for the “typo”. I am very sorry for the spelling mistake. Apologies ! Thank you very much for your efforts to get a copy of the document you have mentioned. Belgian Missionary, Rev Fr Henry Hosten has done extensive investigation and research about the antiquities of Madras and Saint Thomas Tomb area and wrote a book-Antiquities from San Thome and Mailappore’ and published in 1936. I have a quick read through the relevant pages and could not find any mention of such an inscription in syriac. He has mentioned about a lot of Tamil, Armenian, Latin, Portuguese, and Arabic inscriptions. Many of the inscriptions and antiquities are lost due to ignorance of the custodians and taken away to different museums in Europe. If this syriac inscription in the main door of saint Thomas Tomb was there during the time of Hosten’s research, he would not have missed it. So, if this document is preserved in Portuguese National Archives, it will be very important and it may give us valuable information about our history and heritage. There should n’t be a great mystery why Aramaic and Pahlavi both are used. For Persian Chrisitians this will be like us Indians using English and Indian language. Aramaiv is religious, as Latin is used in Roman Church and we all use Peshitta the Syrian bible. Persian Christians even now call themselves Syrians though they are converted to different western evangelical churches. If anybody is making movie, please don’t spread the same old stories of Kerala Brahmins converting – in modern history there is no evidence of Arya Brahmins in Kerala in first century – we were completely a Dravida country. First reveal the budget of the film.I mean an estimation. Take care of the storyline and script so that nothing wrong is potrayed.Wishing u success. About Hosten’s book – I can only say that the main church of S. Thomas tomb suffered many repairs, destruction (due to the wayyyy too many attacks/wars done against the Portuguese in S. Thome of Meliapor) and transformations since the Portuguese first repaired it in 1521-1523. 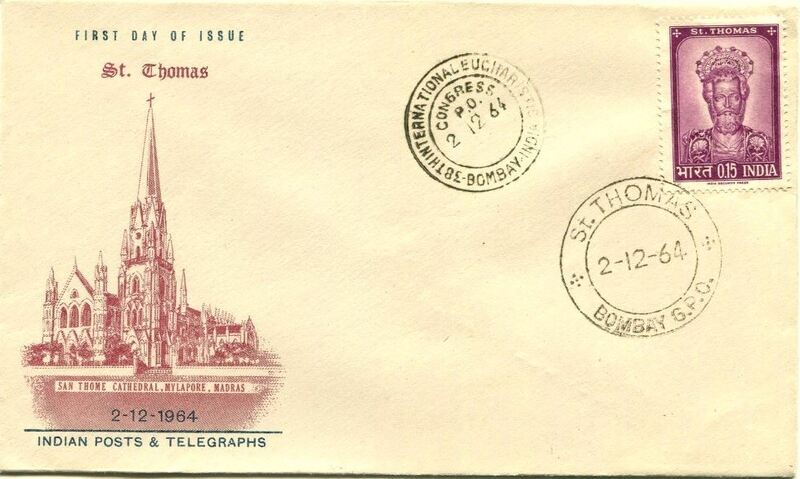 It is difficult even to find photos of the old Portuguese cathedral, that included a dome over S. Thomas tomb. The Portuguese cathedral was demolished in 1893, giving place to the current one in neo-ghotic style, almost 150 years after the British occupation of S. Thome of Meliapor (and not just Madras). So if there was anything from the “original” tomb (as found by the Portuguese) surviving in the old Portuguese cathedral, I am not sure if that survived to its demolition and if there is any info. relative to it preserved somehow in the new cathedral. So it would not surprise me (somehow) that Hosten did not find anything about it in 1936. Published in 1964, by “Centro de Estudos Históricos Ultramarinos” in the Gulbenkiana collection. This series of books published systematically many of the documents found in the Portuguese national (former royal) archives relative to the overseas territories. Then below the Portuguese inscription follows the copy of the Syriac letters/inscription. If written from right to left they are 4 short lines. I can identify (looking at some Syriac alphabet tables) some characters, that would be the equivalent of the Roman alphabet m, l (L), s and h letters. I have no idea at all though of what it says. It was my turn to misspell Prof. Luis F. Thomaz name (with a z, not an s – as I wrongly wrote before). It was in his 1991 paper “The legend of S. Thome the apostle and the Portuguese expansion”, published in the academic journal “Lusitania Sacra” (in Portuguese, 2nd series, n.3) that I discovered about the existence of this inscription. Prof. Thomaz mentions that he could not decipher it. I know Prof. Thomaz speaks Malay and is an expert in the Portuguese presence in the extreme Orient territories, but I am not sure how well educated he may be in Syriac in particular. Since the paper dates to 1991, maybe meanwhile he managed to decipher it. I will try to get in touch with Prof. Thomaz again, that I met personally several times in the past – he is in fact one of the top best Portuguese historians, but nobody can master too many languages at once. Meanwhile I am consulting other Portuguese historians as well – but let me know how can I send you a photo of the inscriptions document then. I am not sure if we can publish it here, due to copyright issues (?? ), but I will gladly send a copy to any experts in Syriac in India you may indicate to me. Maybe the administrator of this website can clarify also the copyright matters and how to post a photo of the document. If you email me a scan of the Syriac, I would be pleased to translate it into English for this NSC list and to provide further historical notes where I can: For example, on the age of the Syriac script used. My email address can be found on my website, on the introduction page, (just click on my name above this message, this link should take you to the correct page). Your work sounds fascinating (looking at your webpage). Thank you very much for your offer to translate it to the NSC list. It is good to have several different/independent possible translations. I just sent the document to your email now – and I already wrote the meaning of the ancient Portuguese legend above the Syriac characters in one of my last msgs to this list. 1. ܐܢܐ ܡܘܣܠܡ I am a Moslem. 4. ܡܢ ܐܠܝܡܐ from Alema. This inscription is written mostly in Syriac. It contains no Arabic forms apart from the word ‘Moslem’ in line 1, which is Arabic written in Syriac letters. Whoever wrote this was a Moslem who was literate in Syriac. The date can be narrowed down to between the Moslem arrival in Kerala (whenever that was?) and the period around the Portuguese arrival in the early 16th century. The Syriac script is Serta and so this inscription could have been written anytime after the 10th century AD when this script began to be more commonly used. The date ‘year 52’ is presumably Anno Domini, which is very odd because Syriac Christians in Malabar tended to use the Syrian dating system, even as recently as 100 years ago. This suggests to me that the author of our inscription was already familiar with a western tradition about the date of Mar Thoma’s arrival in Malabar, (AD 52). Again, this would suggest to me that the Portuguese may have arrived a few years before this inscription was carved above the door. Perhaps it was an attempt to claim ownership? Other Syriac transcriptions, translations, dates and interpretations are of course possible, but these are my initial findings. I am interested to hear what others might have to say. I hope you find this inscription interesting and exciting, I certainly do. I had no idea that there were Moslems who spoke and wrote Syriac in Malabar in the 16th century and I had not previously heard of any tradition linking Mar Thoma to Alema in Syria, (or perhaps the author of this inscription came from there?). Perhaps you, or others on this list can shed some more light on these issues? Just a quick note on the following sentence used above (in the introductory text of this web page – but not the only one such mistake!) where Maabar is confused with Malabar, according to the descriptions of Marco Polo’s book. >> “The body of Saint Thomas lies in the province of Malabar in a little town. Maabar or Ma’bar is another name of the Coromandel coast – not to be confused with Malabar, as it is done in this webpage. The Muslims in particular used the word Maabar it seems – Malabar being separated from Maabar at Cape Comorim. The Portuguese also used Cape Comorim as some delimitation of the Malabar, Fisheries and Coromandel coasts. It seems Maabar may mean in Arabic something like “The passage”, or “the ferry”, according to notes in some of Marco Polo’s current web book/pages. So please correct that information: knowing one’s geography and being very careful with names is extremely important. >You mentioned to me in your email that Mar Thoma’s tomb was kept by a Moor! That explains a lot. according to some Portuguese reports. since even Muslims respected S. Thomas’ tomb as a holy place. S.
could have been written, in abstract no? today, with his supposed tomb as well. Thanks for your reading and explanation of the inscription. This is a very interesting inscription. I have a few thoughts about your reading. It has been documented by the Portuguese Missionaries that the care takers of the tomb was a Muslim. What is the meaning of “in peace he was perfected in the year 52” ? Mar Thoma Sliha is believed to have arrived in Cranganore in AD 52 in Malabar coast. (I think Ramban songs mention about AD 50) The martyrdom was believed to be in AD 72 in Coromandel coast. As you said, Syrian Christians of Malabar used the Greek Era in almost all the documents, before the arrival of Portuguese Missionaries. Portuguese arrival was in AD 1498. Muslim arrival was in AD 629. Mailapore is not in Malabar, but in Coromandel coast. After the full stop in line 3, Thoma from Alema- could this be read together – the author of the inscription ? If this was written by a Muslim, then, as you said, he was well familiar with syriac also. Does it mean that it was the syriac christians in India who were converted to Islam en mass, as the spiritual source of Syrian Christians were the East Syrian Christian community in Mesopotamia, when most of them became Muslims, their co religionists in India also became Muslims (except the small pocket in Malabar, who were probably remained as syriac Christians as they were well united under the leadership of an Archdeacon). My 2nd part of the post here – the system has been considering me as spam!! > the period around the Portuguese arrival in the early 16th century. ancient Nineveh – an old Assyrian city). least since the VII century as well)…? >The Syriac script is Serta and so this inscription could have been written anytime after the 10th century >AD when this script began to be more commonly used. >The date ‘year 52′ is presumably Anno Domini, which is very odd because Syriac Christians in >Malabar tended to use the Syrian dating system, even as recently as 100 years ago. This suggests to >me that the author of our inscription was already familiar with a western tradition about the date of Mar >Thoma’s arrival in Malabar, (AD 52). While I love to believe that Mar Thoma was buried in Mylapore, yet indications in ‘The Apocryphal Acts of Thomas’ show otherwise. I will not dispute that Mar Thoma did not visit Mylapore, but only challenge the belief that he was killed there. There are far too many names in Greek/Hellenized leanings in the book to show that was in Tamil country where he died. Melloula and the Calamine mountains are in Syria and my feeling is that Mar Thoma was killed there. These areas were very heavily Hellenized. The third paragraph of the following article mentions about ‘Quallamoun Mountains’ in Syria and also that there remains a tiny pocket of Aramaic speaking people still there. I guess, you know too well that to preserve Aramaic/Syriac is so difficult as it has severe persecutions upon them. It is truly a miracle that Aramaic is still there under Islam. Now, I am obviously no scholar but do a lot of reading and researching. The Acts of Thomas, is our best available source. I wonder why the grave of Mar Thoma is not opened and examined. Is it morally wrong? Muslims do have a tendency to venerate the tombs of whom they consider as ‘Saints’. Up inthe Western Ghasts, there is a place called ‘Vaghamon’ and there on a peak (highest?) called ‘Tangel Para’ is site where Muslims make annual pilgrimage in reverence to a saint of their faith who is claimed to be buried there. Some groups of Orthodox Muslims consider such reverence as paganism. This was what happened in North Africa, where tombs of Muslims saints were destroyed by fundamentalists Muslims. Many thanks for your post. I should start by saying that I am an atheist, so my approach to all this is based on the interest of history, and not a passionated or less passionated religious point of view. I try to keep as objective and rational as possible. >While I love to believe that Mar Thoma was buried in Mylapore, yet indications in ‘The Apocryphal Acts of >Thomas’ show otherwise. Does it show? Hmmm – many authors question the quality of information in the “Acts”; some even defend that S. Thomas did two travels to India; the Portuguese did find S. Thomas Christians also in Socotora, etc. Calamine/Calamina – may have been in ancient Meliapore, as it was the name of a fish the Portuguese heard from the fisherman when arriving to the location…among many other explanations (??) given to the origin of Calamina. Also the name of the king whose soldiers supposedly killed (according to the “Acts”) S. Thomas, is Mazdai/Meodeus/Misdaeus…and that could be a common name (from Mazdaism/Zoroastrianism) and not necessarily a proper name. So I would not totally trust the “Acts” just per se. To me what is most notable is that Indian Christians kept visiting Meliapore and the tomb of S. Thomas, centuries after centuries – probably never hearing about the “Acts”, in a time before the invention of the printed press (Gutenberg) and wide spread of books (especially originating a continent and many wars apart). I doubt the Church of the East/Nestorians would feed such idea for so long (of having the tomb in Meliapore) just “out of the blue” – what would they have to gain with it? Why Meliapore? Why not any other city, say in Kerala, if they would be lying about it, or the “Acts” are the correct info? So for me the popular tradition has some value, together with other data mentioned above. In any case, I am not totally/mathematically sure (as you question) of this either – but history is not mathematics. As to opening the tomb – it has been opened a few times in the past, last time I know was perhaps in the XVIII century, still under the Portuguese. This about the Meliapore tomb, of course – if you are talking about the S. Thomas’ tomb in Ortona (Italy), it is a different story/history. I discarded Mylapore as the place of martydom of Mar Thoma until I read Abraham BenHur’s book ‘The Jewish Heritage of the Indian People’. Where he makes the ‘unthinkable’ claim that the dominant people of Mylapore … the Pattars… are indeed realted Pathans of Parthia/Afghanistan/Pakistan/India. Indeed, I reject his martydom even today, but am now more soft and leaning to understand that Mar Thoma did indeed visit Mylapore in search of the Pattars (Pattars are today’s Brahmins of that part India). Mar Thoma’s isntruction were to ‘go and get the 10 tribes’ and available indications are that Mar Thoma would have done just that. Large Roman coins and dolmens/West Asian burial sites in Tamil Nadu indicate that the Jews/HEbrews were indeed there. This is totally allien to our mind today and frankly I shake my head in utter disbelief. Even in my wildest dreams, I can not cook up such a fantasy. But logic and harsh reasoning shows that Mar Thoma would have gone to Mylapore. It has been a while since I read the ‘Acts of Mar Thoma’ and I know that the name Calamine plays a point therein. Infact, I remember the Admin of this site advocating that Calamine may mean ‘Kallumallai’ in Tamil or ‘Mount of Stones’ in English. The place where Mar Thoma was/is said to be buried is very familiar to me and it indeed is a mount with much rocks. The possibility of another Thoma to have been killed or buried there can not be ruled out, possibly an Armenian person or businessman by name Thoma. Armenians are known to have set foot around Mylapore many centuries ago. But your claim that the CoE supports that Mar Thoma was martyed in Mylapore is new to me. Can you please give the earliest reference to CoE’s belief in this? The CoE should know. This is a vital piece of information. Regarding your aetheism, no worries!!! Get to know Jesus through the lips of a Jew. Have you held onto to the tassle of a Jew? Perhaps you may not know what a hem of a robe/tassle (tzitzit) is. No worries!! Just google it. Let’s see if I can publish the 3rd part of my post here. >Again, this would suggest to me that the Portuguese may have arrived a few years before this >inscription was carved above the door. Perhaps it was an attempt to claim ownership? The debate about the authenticity of the Apostolate of Thomas in India has a lot to do with Politics of the different colonial churches came to India. The whole story of the divisions of Thomas Christians is also due to the colonial politics. The stupid Thomasine Christians of India fell into these propaganda- even still today. It was the Portuguese who came to Malabar first. They were Catholics. They found the Thomas Christians and propagated in Europe that they found an Apostolic Christianity in India and gave wide propaganda about the Apostolate of Thomas in India. Then the Protestants came. They had to oppose what the Catholic Portuguese say. They spent all their resources to find faults with the theory. We can see, most of the Protestant authors raise questions about the authenticity of the Apostolic tradition of Malabar and they put forward alternative theories- it was Thomas Cana, it was Thomas, the disciple of mani and so on. Many of the Thomasine children are following those arguments even today. If it was the Proetestants came to Kerala first, the situation would have been vice versa. Adolf Medleycote has discussed the Calamina theory well in his book. His arguments seems to be satisfactory also. I have described those in this forum before. Quallamoun Mountains area has syriac speaking christians still today. The term Quallamoun has a similar pronunciation as Calamina. I agree. But have those syriac speaking christians ever claimed that the tomb of Apostle Thomas was with them ? Mailappore is the only place that claims Apostle Thomas martyred and buried there. We have oral traditions for 2000 years. ( I agree, some may claim that these oral traditions were implanted by the Portuguese).Descriptions of several travellers and other testimonies and mentions in various liturgies from Church of the East to even Western confirms this tradition. Testimonies of ‘Joseph the Indian’ in AD 1502 is a witness from a native Thomas Christian. The writing of the early Portuguese missionaries also confirms the tradition of pilgrimage to Mailappore. I think we should study well the ‘Acts of Thomas’. This should give us good leads. But here is something to support that Mar Thoma was killed in India and not in Syria. it could be yet true that syrian immigrations or persian central asian immigrants claiming st thomas came and died their place. but think malabar has it ancient past. ancient biblical history support thing exported malabar to israel. it has geniue jewish connection rather than any christian existance. and how it marvalously connect why the reason st thomas could really reach malabar preached to these populations and spread the good news and he surely able to converts brahimns families, royal families and some others. but all the jewish populations in malabar had different settlement area where they can get a fragment tree to get piece to burn in a pot and get a smoke inside synagoge which is we call it kundrikam. then timber elephan horn, peacock, etc. and these seven syagogle jewish settlement in different part of malabar forest areas turned out to become 7/12 church who kept jewish tradtions and accept esho as messiah. then these few brahimn convert families stated to blent in to these which make it way to become todays nasranis. only then after these syrian as orthodox traditon, nestorians as persian knew about malabar and dreamed to come to these place and knew these jewish people and jewish christian living malabar in their rights and privilages. then when there is more persecutions happened in middleast, some group started to migrate malabar. and these syrian pesrian group might have thier past that converted by some apostoles. By the time the Portuguese arrived to India, the S. Thomas Christians have been out of regular contact with their Assyrian Church for a long while. It seems only in the decades before the Portuguese arrival, finally new “bishops” (the Mar of the Nestorian Church) were sent to the Malabar coast. All this is told in the wonderful story of Joseph of Cranganore – who asked Alvares Cabral to sail to Portugal, Rome and “Babylonia” (higher Mesopotamia – probably Mosul, once again). Cabral made the official discovery of Brazil in 1500 AD, on the way to India – the 2nd Portuguese sea voyage to India, after the 1st of Vasco da Gama, a few years earlier. The S. Thomas Christians became the natural allies of the Portuguese in India, up on this cornerstone of Human Civilization History, when finally the Western and Eastern most Christians meet again – 1500 years later! so it is not easy to know exactly what happened to the tomb of S. Thomas there. Joseph of Cranganore had visited “Babylonia” before and also knew the location of S. Thomas tomb, that some Nasrani/S. Thomas Christians would visit now and then. Joseph brought some soil from the tomb of S. Thomas to the Portuguese King Dom Manuel I, that was quite impressed with the offer and sent Joseph escorted from Lisbon to Rome and later back to India. >I hope you find this inscription interesting and exciting, I certainly do. I had no idea that there were >Moslems who spoke and wrote Syriac in Malabar in the 16th century and I had not previously heard of >any tradition linking Mar Thoma to Alema in Syria, (or perhaps the author of this inscription came from >there?). Perhaps you, or others on this list can shed some more light on these issues? Again – this is the Coromandel, not the Malabar coast, as mentioned above. Alema – hmmm? I have no idea too…maybe this relates to the author of the inscription and not to S. Thomas himself necessarily, as you question…. I hope my humble comments may help a bit. I am a Professor of Astronomy and researcher in astrophysics. History is a very serious “hobby” of mine – so I hope others can make better comments than mine. Steven – once again thanks for the fantastic work so far. As to the Church of the East knowing about the tomb of S. Thomas in Meliapore – see my other posts about Western travellers reports on the existence of Nestorian houses, a church and a big convent near the tomb. This 1 or 2 centuries before the Portuguese arrived. So there must have been some info. available to the CoE about Meliapore – or else why would they built a convent there and stay in the area for at least a couple of centuries? Again history is not mathematics – but these are questions that require serious answers, in order to remove Meliapore from its real or putative importance in S. Thomas’ life. Another piece of evidence about the death of S. Thomas not happening in nowadays Syria (neither probably in ancient Assyria) comes from the Roman Emperor Alexander Severe. According to the Portuguese historian, Prof. Luis F. Thomaz, around 233 AD, after/when the Romans (under Severe) defeated the (Persian) Sassanids under Ardashir I (or Artaxerxes), the Syrians insistently asked Severe to send an embassy to India to bring the tomb of S. Thomas to Edessa – this being the origin of S. Thomas tomb in the city. Severe was friendly (for a pagan Roman Emperor) towards the Christians, and had their wishes becoming reality. Now – bringing the tomb of S. Thomas from India, though it may tell us that the apostle was not killed in nowadays Syria, still leaves open the question of how “India” is defined, or was defined back then? Ancient Mesopotamia was also called India? Anything near or beyond the Indus river? Or farther away already in the Bay of Bengal? As to being an atheist, Jews, Christians, the tzitzit, etc. – I can only recommend reading about the Pacific cannibals of the Cargo Cult. This is the paradigm of the genesis of human stories/religion – and how an USA Air Force cargo carrier became a god. Nietzsche “killed” god long time ago – but people are still, of course, free to believe in whatever they want, and even an atheist respects, of course, such right. no wonder syrian persian should have connections with early chrisitan movement. once Jesus ressuredected, then the apostoles and so many jewish diciples, then the syrians people all withnessed the ultimate truth about jesus christ. and christianity flurished in antioch syria than in jerusalem. it was more safest place for many jewish christians to be in antioch and st paul all seem to missionary work in syrian antioch or damascus. then from there, these spreaded out to persian and so on. but who came to malabar is st thomas only. st thomas came malabar though roman ships or he was visting arragements to buld a palace or then he went back to jerusalam , then he again came back so on all these oral inforamation later written in syrian christian nasrani family history book and many of these family histroy and still stays unique. RE: SYRIAC INSCRIPTIONS FOUND ON THE MAIN DOOR OF SAINT THOMAS TOMB AT MAILAPPORE. Rev Dr Thomas Koonamakkal commented that some of the letters are wrongly written. This could be due to the fact that the document shows a copy of the inscription copied by a syriac illiterate-that means, the copyist wrote the letters from the original inscription without knowing what it is, but just drawing a picture of it. The reading of Koonamakkal Thoma Kathanaar is as follows. Rev Dr Thomas Koonammakkal has added that there could be two possible readings for line 2. (i). In the name of Christ. (ii). In the peace of Christ. In his opinion, the original inscription was corrected by a later hand to get the second meaning. It is clear that somebody has attempted correcting the original inscription. May be the original inscription and correction were made by the same hand to improve the grammar and meaning of the text. This inscription lacks clarity. Either the inscription was not expertly done (this is my opinion), or the copy is not good, or both because the Syriac letter forms are not consistent. For example the Syriac letters Lamed followed by Meem are sometimes written together and sometimes written separately. However, this does not prove that the inscription was altered. For example, these variations might have happened due to lack of space, or lack of skill. Secondly, without a proposed transcription of the Syriac letters by other scholars, it is difficult for me to comment on their translations and interpretations. I posted all three elements together; a proposed transcription and parsing of the Syriac letters, a proposed translation and a reasoned discussion about the script and the apparent contents of the inscription. Thirdly, and as your latest post demonstrates, it takes several attempts to decipher inscriptions. This is difficult, because we all want instant, 100% reliable and certain answers. However, historical work and work on inscriptions and manuscripts in particular, will seldom produce instant results. Nor are the outcomes entirely certain. For example, It took teams of scholars 50 years to publish editions of the Dead Sea Scrolls and even after all that work, many decipherments remain conjectural to this day, 65 years after their discovery! Please convey my many thanks to Rev Dr Thomas Koonamakkal for a very interesting translation – much appreciated. I am trying to get yet another deciphering from an Hungarian professor expert in Syriac too – will let you know when and if I get it. I have no further information than what I already posted here – the name of the publication (out of stock, from 1964) and that the document existed in the Royal Portuguese Archives in drawers of documents coming from many different overseas territories. The publication I mentioned is just a “near-random” collection of all such documents (now part of the Portuguese National Archives) in a particular huge drawer with a pile of documents (a mix from many former Portuguese territories on Earth, but mostly from XVI and XVII centuries). Quite many of these archives drawers have been digitalized and are available on line at the Portuguese National Archives website – but not yet this particular drawer and pile of documents where the Syriac inscription page was located. As far as I know there is no English version of if – but the information available is all what I mentioned already. Someone (in a not indicated date/year) sent a copy (probably with some mistakes, since the author of the copy was not familiar with Syriac) from the inscription in the door of the tomb to the Portuguese Royal archives. The ancient Portuguese comment above the Syriac inscription letters, I already translated it here into English – and unfortunately that is all that is known in Portugal too. I contacted a Portuguese history discussion list and some historians directly – and nobody could add anything else either. I will report back if I hear anything new from Prof. Luis F. Thomaz as well – since it was via his paper that I learn about such inscriptions. So I am afraid I have nothing else new to add. It would be good though to have Steven in touch directly with Rev Dr Thomas Koonamakkal, for the sake of discussing the different deciphering results. Many thanks once again for all your work. Thank you very much for your efforts and expertise in decifering this very interesting inscription. I have consulted two experts, both of them commented that this is very difficult and some words are distinct.. Both of them have given me alternative readings also, as seen above. I am waiting for the permission to quote the other expert in here. I agree with you, without the proposed transcription, it is difficult to discuss. This is similar to the Pahlavi inscriptions on the several ancient granite crosses ( Saint Thomas Crosses) of South India- initially, several people have decifered with several different interpretations, but later, we could see some uniformity. Mr Winkworth is the one who first commented that all these are copies of a single inscription copied by an illiterate and hence letters are not inscribed correctly. Also, it has been documented that the shape of the syriac script also a bit different in India due to the influence of the local language. You post 185764 is simply great. You have fed us with valuable information, which has eluded us for all this while. You have taken pains to give us this information. Thank you very much. Just today, I was advised by a freind that in order to understand Malabar Nazerene history, a good knowledge of world history and a world outlook is very neccessary. You have confirmed that advise. Rev Dr Koonammakkal has kindly sent me his transcription. In the second line, the first word is corrected into bshlm by the original writer or a later hand. In this line, the last h has a dot underneath. In the 3rd line, the third letter is small L. In the same line, the first letter of the 2nd word is small L. In this line, the last h has a dot underneath. In the 4th line, in the 2nd word the first letter is small L.
I hope this will help you to make your comments. Line 1: The third from last letter in the line is a very clear Semcath. This is one of the clearest letters in the inscription, very different to the letter sheen elsewhere inscribed here. Following this line of reasoning, the second word on line 1 is ‘salaam’ = peace (Arabic). If this is correct, I don’t understand how the first word on line 1 could be the name ‘Thoma’. The Syriac letters in this transcription suggest a pronunciation ‘Tema’ for this name. I am not a competent Arabist, but I don’t understand that. When I worked on my transcript, I didn’t see it right away, but if the letters are grouped differently the Syriac letters spell out the word meem-waw-semkath-lamed-meem = ‘Moslem’ (Arabic). Line 2: This line, in this version of the transcription is entirely in Syriac (not Arabic), because although I am not very skilled in Arabic, I know that the Syriac word msheeha = Messiah is missah in Arabic. This is strange, because according to this transcript, line 1 contains an Arabic greeting, but lines 2, 3 and 4 are entirely in Syriac. How likely is that? Line 3: The Syriac letters in line 3 are a very interesting puzzle. There is some agreement with my transcript for the 1st and 3rd letters. Thomas has suggested sheen, lamed and yod, and I suggested sheen, nun, yod as an abbreviation for sheen nun yod taw = ‘Shnit’ = year. I think the next word is a problem in this version of the transcript. There are several instances of the letter waw in the inscription, but I cannot see a waw which should be in the inscription of the word nohama = resurrection was inscribed. On the other hand I can see every letter of Th’oma represented in line 3. I did not see it at first, but if we work backwards from the end of line 3 it is easier for me to explain: The final two letters are not disputed by Thomas, we agree on meem then aleph. Then working to the right, I can see an imperfectly and rather triangularly engraved waw, then the bottom of a vertical stroke, which I think might be an aleph, then a rather clumsily engraved taw. Putting these letters the correct way around we have taw-aleph-waw-meem-aleph which is how the name ‘Thoma’ correctly written in Syriac letters. Line 4: Historically this may be the most fascinating line of this inscription. When I first looked at this inscription, I wondered whether Alaha = God might be the final word in line 4, but try as I might, I could not persuade myself that the penultimate letter is a ‘he’ because it really looks to me like a meem: It is just missing the lower ligature which may originally have joined it to the final aleph. Also, I can see a yod in there after he lamed, which cannot be there if ‘Alaha’ was inscribed. So, the last word on line 4 reads to me as aleph-lamed-yod-meem-aleph = Alema. This looks like a valid toponym for a town SE of Damascus in Syria. Could whoever inscribed this, be telling us that Mar Thoma Sleeha was from Alema? Has anybody wondered about their DNA test. According to FDNA the haplogroup is decided from the 12 markers. What if the haplogroup for 12 markers is J , the 67 marker is L and the 111 marker is G . I think the haplogroup should be decided on the 111 marker and not by the 12 marker. If it is only by the 12 marker then the other tests are a waste of money. FDNA recommends the deep clade test where you have to pay to get the haplogroup. There is no need to pay when there is the Whit Athley predictor which gives one the haplogroup for free. The Y dna haplogroup defined by 12 markers will not change even if you do 111 markers. Haplogroups are defined by SNP’s and not STR’s which denote the 12 or 67 or 111 markers. But 12 marker STR’s or allelle nos are adequate to define in a large % cases to predict the Y dna Haplogroup. STR’s of higher resolution help in matches in recent past. while SNP’s are one off events when a major mutation or an addition or deletion of a portion of the ydna occurs. These SNP’s allow whole of humanity to be divided into distinctive haplogroups. 01.01 When it is suggested that, Christianity is older than Hinduism in Kerala it is quite likely that much may be argued in favour of the opposite view, as it has been argued, in place and out of place, by many, down the decades of the past century or two. Only there is something to be said against the stand often taken for granted that Hinduism was here in Kerala from time immemorial, and that Christianity here was the late-comer, and that is what, on the present occasion , I have to say.1 As Stevenson goes on to say, to state one argument is not necessarily to be deaf to all others.2 All the same the title Christianity Older than Hinduism in Kerala, even if it appears like an Irish Bull3 or ludicrous inconsistency in speech, in truth only states a fact, a fact often well understood by scholars of Kerala History, but generally not honestly admitted or boldly stated. It may even be that the Syriac script and liturgy – surely the pahlavi script – were in Kerala much before the Devanagari and the Vedas found their foothold here. In spite of the many statements in Keralolpathy most historians today believe that the Parasurama story is only a legend and Brahmins arrive in Kerala for all practical purposes only in the 4th century or later, and the Brahmins or Namboodiris establish dominance only around the end of the first millenium C.E. In the time available for this paper it will be possible merely to have a passing glance at some facets of the problem, and that too in a most cursory manner. 02.01 To commence with, it may be useful to examine a few definitions / descriptions of the terms Hindu and Hinduism.Hinduism is the religion of the Hindus, the people of Hindusthan. The land lying to the east of the river Sindhu was called Hindusthan by the Persians, the word Sindhu being pronounced by them Hindu. Thus the name Hinduism is geographical in origin.4 Even today the river Sindhu for the westerner is the Indus.In this sense Hinduism is a western term for religious beliefs and practices of most of the peoples in India5 referring to almost everything in the land or lands across the Indus sometimes even up to China.6 In this broad sense Kerala formed a part of India and thus could be considered Hindu from the first century onwa ds (cf.the first century B.C./A.D. writings of Roman authors like Pliny,7 which author calls Muziris primun emporium Indiae). It is possible that many Greek and Roman writers when they spoke of India had mainly Kerala in their mind.8 In this geographical sense of Hinduism, and only in that sense, was Kerala the abode of Hindus and Hinduism from the earliest centuries. 02.05 To understand the origin and spread of Brahmins or Namboodiris in Kerala let us go through the words of Dr. Kesavan Veluthat in some detail:The Brahmans of Kerala are known as Nambudiris. Historical evidences as well as their own traditions suggest that they came from North India and settled down in Kerala, migrating along the West Coast. It is clear that they constitute links in a long chain of migration along the West Coast of India, carrying with them the tradition that Parasurama created their land and donated it to them. In fact, one sees this tradition all along the West Coast from Sourashtra on; and the Brahmanical tradition in the Canarese and Malabar Coasts is nearly identical to one another. According to that tradition, Parasurama created the land between Gokarna and Kanyakumari and settled Brahmans there in sixty-four gramas or villages. As a result, the Brahmans of Kerala share several common features with the Brahmans of the Canarese coast; this also distinguishes them from their counterparts in the rest of South India. In a historical inquiry, this is extremely important. What is necessary is not to look for the place of their origin or the identity and date of Parasurama but to ascertain the social function of such a tradition and examine the extent of linkages between the two regions and their cultures. It is stated that thirty-two out of the sixty-four gramas are in the Tulu speaking region and the remaining thirty-two in the Malayalam speaking region in Kerala. Recent historical research has identified these settlements on either side of the border. Those in Kerala proper are listed in the Keralopatti, the narrative of Kerala history. 1. Payyannur, 2. Perumchellur, 3. Alattiyur, 4. Karantola, 5. Cokiram, 6. Panniyur, 7. Karikkatu, 8. Isanamangalam, 9. Trissivaperur, 10. Peruvanam. 11. Chamunda, 12. Irungatikkutal, 13. Avattiputtur, 14. Paravur, 15. Airanikkalam, 16. Muzhikkalam, 17. Kuzhavur, 18. Atavur, 19. Chenganatu, 20. Ilibhyam, 21. Uliyannur, 22. Kazhutanatu. 02.07 The above authorities incontrovertibly establish the fact that Brahmins and Brahminism along with Vedic Hinduism arrive in Kerala only many centuries later than the commencement of the Christian era. The Nairs, who belong to the Chaturvarna or four castes, though they form the lowest rung of the caste system as they are Sudras, appear on the scene even much later than the Brahmins, perhaps as late as the 12th century C.E. Centuries before there is any trace of Vedic Hinduism in Kerala there are many well established evidences for the existence of Christians in Kerala. Christianity would appear to be the oldest existing religion in Kerala, much older than any other organised religion including Islam. 03.01 Vigrahas or images of vedic Hindu gods and goddesses appear in Kerala only after the 11th century, much later than the rock crosses.14 Even at the Salem, Erode portions of the Chera Kingdom and the Venad, Kanyakumari sector they appear only mostly after the 9th century. In fact all the Vigrahas or images of Hindu gods and goddesses appearing anywhere in Kerala are datable to a period much later than the time of the Pahlavi crosses of St. Thomas Mount, Kottayam, Kadamattam, Muttuchira, and Alangad. 03.02 For example, according to the studies published by K.P.Soundrarajan, Directoe, Archaeology Survey of India, 1978 the Vigraha of 1.Aja Eka Pada first appears in Thondamandalam in the 8thC, in Cholamandalam in the 11thC, in Pandimandalam in the 13thC. (2) ArdhaNareeswara appears in S.India only after the 7thC and in Kerala only after the 9thC. (3) AnanthaShayi S.I. 6thC and Kerala 8thC. (4) DakshinaMoorthy Kerala 8thC. (5) Ganesha Kerala 8thC. (6) Harihara Kerala 1 1thC. (7) Jvarahareshvara 13thC. (8) Jeshta 11thC. (9) Lingothbhava post-11thC. (10) SapthaMatha 14thC. (11) TriMoorthy 8thC.15 Oldest Hindu idols of Kerala are found in areas outside our present Kerala, beyond the ghats in Kongunadu from Salem- Dharmapuri or beyond Trivandrum. Thins would mean that in central Kerala the homeland of most of the ancient christians Hindu images appear even later. The oldest Hindu and even Buddhist statues of Kerala are attributed to the 9thC or later by Dr. M.G. S. Narayanan also.16 Hence of all the rock images in existence in Kerala the Pahlavi crosses are much older than any Hindu Vigraha. 03.03 One might here genuinely ask about the existence of innumerable old temples in Kerala, and temple festivals. Most of these temples are Kavus dedicated to Bhagavathy or an ancient mother-goddess. The well-known Trichur Pooram festival, for example, is only a get-together of a dozen Bhagavathies, and Shiva or Vadakkumnathan has nothing whatsoever to do with it, although the festivities rtake place around the Vadakkunnathan or Shiva temple. The Thidambu or image in gold or silver carried by the elephants depict only or chiefly the Bhagavathy of Paramekkavu, Thiruvambady etc. and there is no proper Hindu god or goddess honoured during these festivals. 04.01 Any discussion of Hindu origins and development, especially w.r.t. Kerala, would be quite inadequate without reference to Adi Sankara, the great reformer, teacher, scholar, and author. Sankaracharya flourished ca. 8th C C.E. or in the first century before or after the commencement of the Malayalam or Kollam Era in 825 C.E. The great sage was born at Kalady or at Veliyanadu on the opposite shore of the river in his mothers house. In either case he was born in the midst of a great christian population affiliated to churches established many centuries before his birth at nearby places like Malayattoor, Angamaly, Parur, Edappally &c. on the river banks or Churni or the Periyar. How far his life and thoughts have been influenced by this strong christian presence around him remains to be explored in full. 04.02 Sankara in his 64 Anacharams or code of conduct for Namboodiris or Malayalee Brahamins specify that only white dress must be worn by members of the community. Now it is well known that Brahmin women in S. India in Karnataka or Tamil Nadu or Andhra wear only dark coloured Chelas from Kancheepuram or elsewhere. The christian women of Kerala are well known for their white dress with the beautiful fan-like arrangement at the back called njori which adds to their beauty and testify their admirable modesty. By adopting the white dress and the njori the Brahmins of Kerala were trying to ensure their aristocracy. 04.03 Sankara further enjoins his community to eschew all nasal ornaments: Nasabharanam Nishidham, although Brahmin women elsewhere in India are addicted to nasal ornaments. It is for the christian community of Kerala alone that Nasabharanam is Nishiddham and nasal ornaments still remain taboo to ancient christian women of Kerala and to the Antharjanams. 04.04 Into the similarity of many other customs of Brahmins and christians it is not necessary to enter here. Although the similarities in the birth ceremonies, marriage ceremonies, and funeral ceremonies of these two communities are quite striking, often indicating that, the Brahmins when they arrived in Kerala borrowed the customs of the then ruling community of Kerala viz. the christians. 05.01 Although many of the matters mentioned in this paper must have been well understood by the Brahmin and upper caste scholars, somehow efforts to make these matters common knowledge were never made or suppressed. One theory that helped keep things hidden was the Lacuna theory or Dark Chapters theory. Those who wrote history said that the second half of the first millennium in Kerala history was a dark age and a lacuna existed in our knowledge of this period. These 500 years between 500 C.E. and 1000 C.E. were precisely the centuries when age-old christian dominance in Kerala declined giving way to Bramin asendency.However there are many documents dealing with this period which are ignored or deliberately overlooked by such historians. 05.02 Many of the earliest existing documents in Kerala history deal with the Christians or Mar Thoma Nazranies of Kerala often called the Syrian Christians. The half a dozen Pahlavi crosses are one set of such records. The kinayi Thoman copper plates, the Thazhekkad Rock inscription, the Tharisappalli copper plates, are another set of records. All these belong, certainly, to the first millennium C.E. 05.03 The oldest places in Kerala are connected with the encient christian community of kerala. Palayoor, Parur,and Kodungalloor are instances of this. It may be remembered that these three places, which occupy a place of pry in the St.Thomas Apostolic stroy are all on the oldest and bigest geoliliogical plate underground, so that generally these places were never affected by earthquekes. 05.04 By the reverse projection of Keralas population we may arrive at a figure like 300,000 for the population of Kerala in the Ist century.If the stories of convertion of people by St.Thomas has anycredibility the majority of people in Kerala, mostly inhabitting the 7 places where the apostle worked, must have become Christians-and the types of political and social systems and institutions of the Sangham age were perhaps very much influence by this huge and powerful Christian Community. 05.05 The large of Ist century BC/AC Roman Gold coins of Agustus, Tiberius and Nero discovered from the Palayoor and Parur belts indicate the close contact these areas had with conuntries and cultures on the western side of the Arabian Sea. 06.01 Just two more paragrphs: One about the status and social possition of the christians in the early centuries. Only hundred and fifty years back when women in Kerala tried to cover the upper part of their body there was a huge commotion which resulted in the Channar Lahala or the mutiny of the Channar caste. But then 1500 years back christians in Kerala were wearing silk gowns, silk turbans, gold ornaments above their head and on their body. Even today the gold business in Kerala is mostly in the hands of Nazranies: Alappatt, Palathingal, Josco, Thottan, Alukkas..etc. The 72 privileges enjoyed by christians even before the different copper plate grants reassured their right to continue to enjoy those privileges indicate that the christians were the predominant and ruling community of Kerala before the Brahmins gained dominance towards the end of the first millennium. The marriage customs of the christians described here yesterday will throw considerable light on the royal privileges and aristocratic status of the christian community in Kerala during the past well-nigh 1900 years. 06.02 The art and architecture of these christians – with their rock work, metal work, wood work, ivory work and artistic creations in every known medium – and with their deepastamba or lampstand, dwajasthamba, or flagstaff, rock crosses inside and ooutside the churches, their baptismal fonts-bear ample testimony to their place in society in bygone centuries. The base or pedestal of the open-air crosses are like the balikkallu or Sacrificial altar stone of the temples. But the bali on the balikkallu in the rock crosses is the supreme bali of jesus symbolises by the cross – the MahaBali. Also it is interesting to note that all the crosses rise up from the lotus. In fact the national flower lotus, the national bird peacock, and perhaps even the nationall an,mal the tiger first appear in kerala art on the rock crosses.Some of these you must have seen yesterday when you visited the Valiyapalli. 07.01 All these facts indicate that Brahmins and Brahminism and Vedic Hinduism arrive in Kerala at a very late date and become powerful only by the end of the first millennium, while christianity was here many centuries prior to that, and was here perhaps a strong presence even in the first centuries. 07.02 These facts are presented here to elicit your valuable opinions and comments. Thank you. 1.&2.R. L. Stevenson, An Apology for Idlers in Virginibus Puerisque. 3. But see: G.K.Chesterton, George Bernard Shaw, Bodley Head Library, 1937, chapter one, third paragraph. 4. Swami Siddinadananda, Hinduism, in the St. Thomas Christian Encyclopaedia of India, Vol.III (in the press), Ed. Prof. George Menachery. 5.The Columbia Viking Desk Encyclopedia, Dell, 1964, p.803. 6.Here is an early 20th century definition of Hinduism (The New Standard Encyclopaedia, 1936, p.641): Social and religious organisation in India. It is a development of Brahmanism and is divided into a number of groups. There were in 1931 altogether 239,195,140 Hindus in India, and they are thus the dominant people in the land. Early Brahmanism was affected by Buddhism and both existed down to about A.D. 800, when the latter disappeared from the peninsula, leaving a new Brahmanism, the product of both philosophies. This modern Hinduism, based on the Puranas, gives less prominence to Brahma than to his associates Vishnu, the preserver, and Siva, the destroyer and reproducer. They are worshipped in innumerable forms, both in their male and female aspects, the latter being emphasised by Saktiism, which derives its teaching from the Tantras. 8.For a scientific but short discussion and proofs of early Greek and Roman knowledge of India and Kerala nothing better can be suggested than The Apostles in India, Fact or Fiction ? by A.C.Perumalil S.J. first published in 1952 (Patna). Also cf. Pliny, 6.23 (26); Schoff, H. Wilfred, The Periplus of the Erythraean Sea, Longmans, 1912, p.232; McCrindle J.W, Ancient India as described in Classical Literature, Westminister, 1901,p.111. 11. M.G.S. Narayanan, Namboodiris – Background and Early Settlements in Kerala, paper presented at LIREC, Mt. St. Thomas, 4th Sept., 2000. 12.Kesavan Veluthat, The Nambudiri Community: A History, paper for the LIREC seminar, Mt. St. Thomas, 2000. 13. Emphais by the present writer. 14. Kesavan Veluthat, op. cit. 16.Prof.George Menachery, Social Life And Customs Of The St.Thomas Christians In The Pre-Diamper Period, in The Life and Nature of the St.Thomas Christian Church in the Pre-diamper period, Ed. Bosco Puthur, Kochi, 2000, p.197. 17.Id., Ibid, p. 202, f.n. 27! To bring together the vast store of knowledge required to fulfill the Encyclopedia’s purpose, an editorial board was constituted consisting of some of the best minds in the field. In order to ensure the authenticity of each entry the editors enlisted the aid of an editorial advisory board of scholars representing the most distinguished men in the world of Christianity. The most brilliant authorities in India and abroad have contributed their special knowledge through hundreds of definitive articles. Whenever possible the person most closely associated with a particular subject was chosen to write upon it. The pages of the Encyclopedia are illustrated with vivid, on the spot photographs and paintings in glorious full colour and striking black & white reproductions, in addition to the many sketches, charts, maps, tables and diagrams. STCEI is a long awaited and much needed reference title for all libraries of religion and theology. It is thorough in its coverage of Christianity in India. Its articles are autographed and authoritative. Valuable too are the bibliographies accompanying most of the articles .. rich with maps, tables, and plates. A highly recommended reference tool for hard to obtain information – Kenneth OMalley, C.P.,Library Director,Catholic Theological Union, Chicago. It is a lavishly produced work, much better produced than what usually comes from India … The whole approach is ecumenical both in intent and content – Eastern Churches Review. London, U.K.
Each major article is written by an expert – – R. N. S., New York, N. Y. An extra ordinary publishing achievement of lndian Christianity – USCC Bullettin. Washington, D.C. I read all these evidences and assuptions.But,I wonder,Is there any tamil poetic evidence exists? It should be there,I think so.Because,it was the Pndiyan kings who were the architects of the Musiri harbour and the representations of the pandiya kings were there at the court of Augustus.I want to know the exact name of the pandian king and the Tamil poetic scholars of that day. In my understanding of the journeys of St. Thomas, as I have researched it looks like he undertook 2 journeys. First from Edessa itself, tracing the Euphrates/Tigris river route to reach India, up to North of India. along the way he evangelized and found churches. The Chaldean Church of what is now Iraq, the Christians of what is now Iran, Afghanistan and Pakistan all trace their origins to St. Thomas. Evangelist Sadhu Sundar Singh confirms to meeting wandering nomadic Christian ascetics of North India, Sadhus who claimed their origins to St Thomas, who were actually remnants of his disciples. After that he went back to Edessa where he wrote an account of the events in India of king ‘Gundaphor’. From Edessa he traveled to Egypt and waited for a chance in a ship to sail to South of India where he knew there was a Jewish colony existing from the time of king Solomon. He reached the shores of what is now known as Kerala but in his time it was known as ‘Malyankara’ on the Konkan/Malabar coast through a well traversed sea route based on the monsoon winds. After converting the Jewish families and some natives to Christianity, he traveled to Mylapore on the Coromandel coast and met his martyrdom there. The account of his first journey, written by himself was discovered in Egypt. The account of his works in Kerala were preserved by his people who are called the ‘St Thomas Christians’ in a folkloric song form called ‘Thoma Parvam’.